I'll dream a life of loving You. Then I will choose a dream of loving You. I'll dream myself there at Your feet. If thoughts are things and dreams come true. part of Soul Calls Trilogy, a collection of introspective music meditations and chronicles of devotee’s journey toward Oneness. In his writings, Gurudeva Paramahansa Yoganandaji speaks of the dream nature of this world and of the soul's power of free will; the ability to control it's destiny through the power of thought and right understanding which is born of deep, silent, meditation. 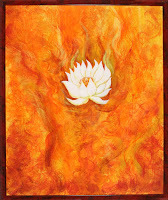 About the Artist: Saranya is a disciple of Sri Paramahansa Yogananda. A practicing Kriyaban yogini since 1972, with profound gratitude for the help of her Great Gurudeva, Saranya brings to the Soul Calls an intimacy born of personal experience of the struggles and joys on the soul’s journey toward realization of Oneness with the Divine Beloved.
. follow this link to get your copy of Soul Calls.